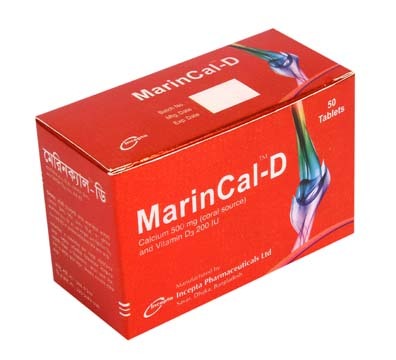 Marincal-D: Each tablet contains Calcium Carbonate (Coral source) 1250 mg equivalent to elemental calcium 500 mg and Vitamin D3 200 IU as Colecalciferol BP. Marincal-D is the combination of Coral Calcium and of Colecalciferol where Coral Calcium is composed of calcium carbonate with small amounts of magnesium and other trace minerals. Coral Calcium ensures better absorption than calcium of other calcium carbonate origin due to its chemical structure that is very similar to the composition of human bone calcium carbonate. Vitamin-D aids in the absorption of calcium from GI tract and helps to maintain calcium balance in the body. Marincal-D is indicated for the treatment & prevention of osteoporosis, osteomalacia, tetany, hypoparathyroidism, disorders of osteogenesis. It can also used as supplement in case of inadequate intake of calcium in childhood diet, rickets, pregnancy & lactation, elderly patients. Other indications include pancreatitis, phosphate binder in chronic renal failure etc. Flatulence, diarrhoea, constipation, upper GI discomfort, allergic reactions etc are rare manifestation. Hypercalcaemia due to prolong use has rarely been reported. In mild hypercalciuria, careful monitoring with reduction of dose is sufficient to return to normal serum calcium concentration. Plasma and serum calcium level should be monitored in mild to moderate renal impairment and also in case of long term use. Patients with renal stone or with such previous history should be recommended to increase their fluid intake. Marincal-DTM should be given to pregnant and lactating mothers as per recommendation of physician.